We’d love your help. 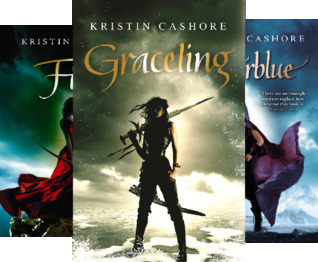 Let us know what’s wrong with this preview of Graceling Realm by Kristin Cashore. In a world where people born with an exceptional skill, known as a Grace, are feared and exploited, Katsa carries the burden of a skill even she despises: the Grace of killing. She lives under the command of her Uncle Randa, King of the Middluns, and is expected to carry out his dirty work, punishing and torturing anyone who displeases him. Breaking arms and cutting off fingers are her stock-in-trade. Finding life under his rule increasingly unbearable, Katsa forms an underground Council whose purpose is to combat the destructive behaviour of the seven kings - after all, the Middluns is only one of the Seven Kingdoms, each of them ruled by their own king and his personal agenda for power. When the Council hears that the King of Liend's father has been kidnapped Katsa investigates ... and stumbles across a mystery. Who would want to kidnap him, and why? And who was the extraordinary Graced fighter who challenged her fighting skills, for the first time, as she and the Council rushed the old man to saftey? To ask other readers questions about Graceling Realm, please sign up. So, here's the short tale of me: I grew up in the countryside of northeastern Pennsylvania in a village with cows and barns and beautiful views from the top of the hill and all that good stuff. I lived in a rickety old house with my parents, three sisters, and a scattering of cats, and I READ READ READ READ READ. I read while brushing my teeth, I read while chopping parsley, the first thing I reac So, here's the short tale of me: I grew up in the countryside of northeastern Pennsylvania in a village with cows and barns and beautiful views from the top of the hill and all that good stuff. I lived in a rickety old house with my parents, three sisters, and a scattering of cats, and I READ READ READ READ READ. I read while brushing my teeth, I read while chopping parsley, the first thing I reached for when I woke up in the morning was my book; the only two places I didn't read were in the car and in bed. What did I do then? The one thing I liked even more than reading: I daydreamed. At 18 I went off to college-- thank you, Williams College, for the financial aid that made this possible-- and it almost killed me. College is hard, man, and the Berkshires are cloudy. A (phenomenal) year studying abroad in sunny Sydney revived me. After college I developed a compulsive moving problem: New York City, Boston, Cambridge, Austin, Pennsylvania, Italy, and even a short stint in London, where my showerhead hung from the cutest little stand that was exactly like the cradle of an old-fashioned telephone. The best phone calls are the pretend phone calls made from your telephone tub. During my stint in Boston, I got an M.A. at the Center for the Study of Children's Literature at Simmons College. (Thank you, Simmons, for the scholarship that made this possible!) Grad school almost killed me, but I felt a lot more alive than when I was almost being killed in college. The Simmons program is stupendous. It got me thinking and breathing YA books. It got me writing. Since Simmons, I haven't stopped writing, not once. I've developed a compulsive writing problem that makes my moving problem look like a charming personality quirk. I can't stop! But it's okay, because I don't want to stop. I've been writing full-time-- well, more than full-time, really-- for about 4 years now, first doing educational writing for the K-6 market and now working on my novels. It's a dream job, which is another way of saying that when I shop for work clothes, I go straight to the pajamas section. Should I say a little bit about what I'm like? I'm fiercely independent. I am sometimes a hermit, but never for very long. I am in search of the perfect cat. I'm a recovering Catholic. I meditate, and when I do, Prince Harry appears in my subconscious and meditates with me. It's a little strange but I don't think there's anything I can do about it. Sometimes he's not the only one; the other day it was me, Prince Harry, the Dalai Lama, Mr. Rogers, Coco the gorilla, and George Clooney. We were all floating above the earth looking down at the continents as they passed. George Clooney suggested I visit Providence, Rhode Island. The Dalai Lama sighed deeply and said he'd really like to visit Tibet.